Since I was a fool and missed Raul Esparza’s last mind-blowing on-stage pairing, it was even more exciting to see him co-star in a musical with Broadway’s leading lady, Sutton Foster. That man is a fantastic dramatic actor, but he really needs to do more musicals. 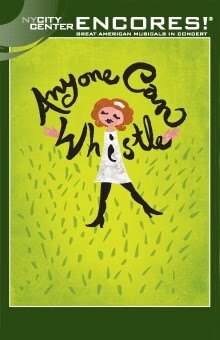 The show is City Center Encores!’s production of Anyone Can Whistle. This i s a rarely performed Sondheim show, and it’s got a collect-’em-all factor for fans. To summarize this play would be missing the point. If you don’t understand it (which I didn’t), there is still fun to be had. But for a primer, it’s about a plotting mayor, played by Donna Murphy, who rules over a destitute town. A rock starts spouting water and people flock to the town to see it and the “mayoress” charges them for it. Suddenly, Raul Esparza arrives to sort out the town crazies and the mayor is out to arrest Sutton Foster for questioning the validity of the lucrative miracle. Murphy is enraptured in her role as Mayor Cora Hoover Hooper. She emits classic Broadway ham and it’s delightful. She is having the most fun of anyone on stage. Foster could not be cuter as Fay Apple, who is playful as a faux French spy one moment, and then singing the heartbreaking titular number the next. Her deadpan-delivered jokes strike the hardest, and Foster’s voice soars with Sondheim’s score. She is truly an actress who has it all. Esparza is in different form than usual, taking on a light, comedic role. Despite his talents for drama, he is adorable as J. Bowden Hapgood, and wears his silliness just as well as he does his handsome suit. There is some great choreography by Casey Nicholaw (who also directed), and what’s even more incredible is how swiftly the cast and creative team had to throw it all together (it’s a only a five-performance run, stretching from Thursday to Sunday). The ensemble is sprite and colorful, and they get down with the leads, which is pleasant to watch. Part of what made this a great theatrical experience was the audience’s response. Being such a short run, the massive, 2,750 seat (!!) City Center theater is jam-packed with people who are dying to be there. Everyone was elated upon each individual entrance of Murphy, Foster, and Esparza. That sort of anticipation and thunderous reception can’t help but boost the mood of an evening. Editor’s note: City Center has a student ticket policy, only for certain events. The Encores! productions sell out, so student tickets to Anyone Can Whistle are unlikely. However, tickets to the show sold for as low as $25—a fantastic price for a truly special night of theater, considering the stars and the authorship of the work.